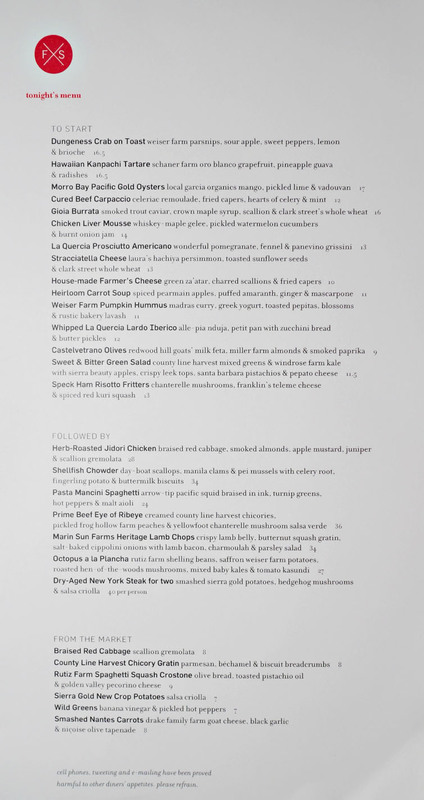 This week's dining adventure brought me to Farmshop at the Brentwood Country Mart, a place that I'd been mildly curious about ever since its debut in November 2010 (though dinner service commenced almost a year later, thanks to delays with the beer-and-wine license). 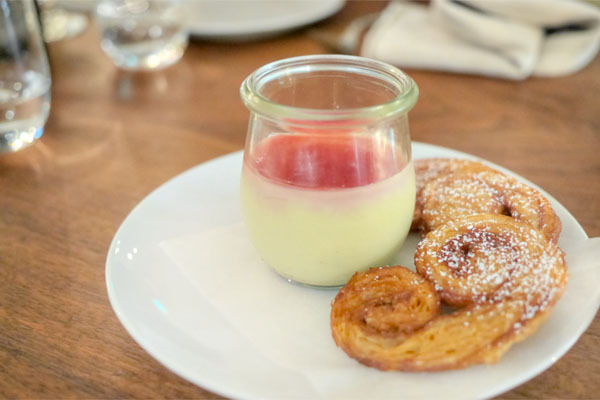 It's an all-day dining-slash-bakery-slash-market concept from Chef/Owner Jeffrey Cerciello, a Thomas Keller Restaurant Group veteran who previously headed up all of TK's casual dining spots. 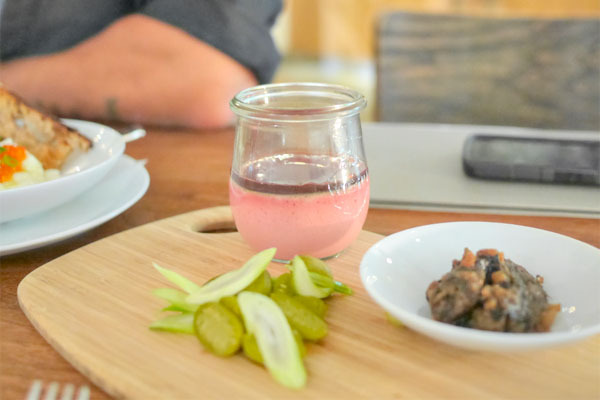 The cooking is billed as "seasonal California cuisine" and the place also offers wine, cheese, charcuterie, and other artisanal-y type things for sale (the "shop" part of the joint). About the Chef Patron: Cerciello grew up in the OC, Laguna Hills specifically, though his childhood wasn't particularly culinarily focused. He attended Cal Poly Pomona with the goal of attaining a business degree, but fell in love with cooking while helping out in a family friend's kitchen. This led him to switch majors to Hotel and Restaurant Management, and after graduation, he found a position at the Surf & Sand Resort in Laguna Beach, cooking under Chef Claude Koeberle (currently owner of Soliste Wines). Following, Cerciello enrolled at the Culinary Institute of America in Hyde Park, and during this time worked two summer stages in Spain: at El Bulli under Ferran Adrià and at Totel under Francisco "Paco" Torreblanca. He finished his studies in 1993, and eventually made his way to Napa to help open the Wine Spectator Greystone Restaurant at the CIA's St. Helena campus. From there, Cerciello secured an internship at the then unknown French Laundry, which had just been taken over by Thomas Keller in 1994. The internship turned into a fulltime job on the line in 1995, and he stayed there until 1998, when Bouchon opened. 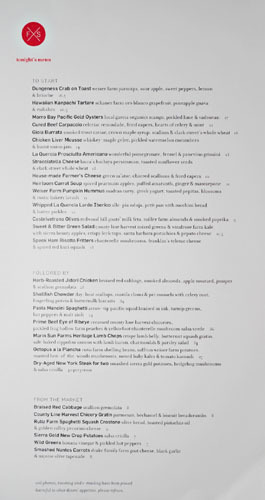 Cerciello would eventually become the Executive Chef of the place, and later was named Director of Casual Dining for all of Keller's restaurants (which includes Ad Hoc). However, he would leave in 2010 to work on his first solo project, Farmshop, but not before trying his hand at Vita, an Italian concept in Yountville planned in partnership with Laura Cunningham (former GM of Per Se and French Laundry, TK's fiancée, and also his sister-in-law). The restaurant never came to fruition though, and was cancelled in 2011. Farmshop, meanwhile, bowed at the end of 2010 with Chef de Cuisine Joshua Drew at the helm. Drew, for his part, started out at the original Bouchon in 2004 before moving to Quince in San Francisco and Vetri in Philadelphia. His last position prior to Farmshop was that of Sous Chef at Ad Hoc. Also on the opening team were Director of Operations Michel Darmon (yet another TK alum, who also spent time at Guy Savoy) and Pastry Chef/Head Baker Brittainy Turnquist, a Bouchon Bakery veteran who has since decamped. Note that Cerciello opened a second branch of Farmshop recently in the Bay Area, set in the Marin Country Mart at Larkspur Landing. 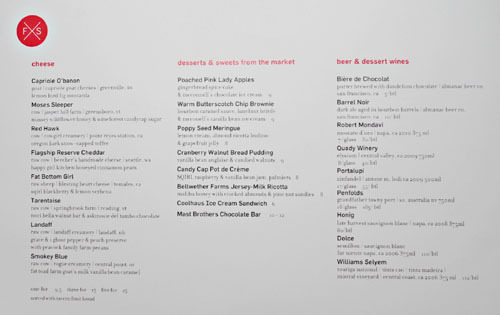 That one's run by Chef Mark Hopper, who, unsurprisingly, worked for Thomas Keller in the past as well. Farmshop resides at the address previously occupied by City Bakery. The space was revamped by Commune Design in collaboration with Cerciello's wife Kira Cunningham, the restaurant's Creative Director. One side of the room holds the market, while on the other, it's a comfy, cozy sort of vibe with those teal velvet banquettes (one side backed by the open kitchen), large expanses of dark walnut, B&W photo mural, and the requisite communal table. It may not be groundbreaking, but it works, really well apparently, as the restaurant received a 2013 James Beard Foundation nomination for its design. Farmshop's menu has a sort of modern-rustic Cal-Med thing going on. 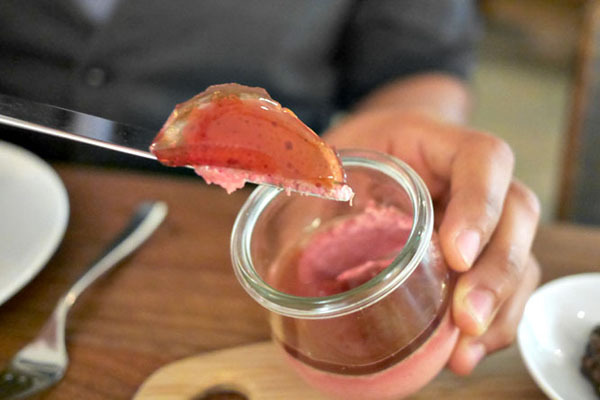 Though the restaurant opened with a four-course, Ad Hoc-inspired family-style menu, the idea was quickly replaced with the à la carte selections we see today: basically small plates, large plates, sides. To drink, think Cali-centric beer, a solid selection of wines, and lightweight cocktails (there's no full liquor license). Click for a larger version. 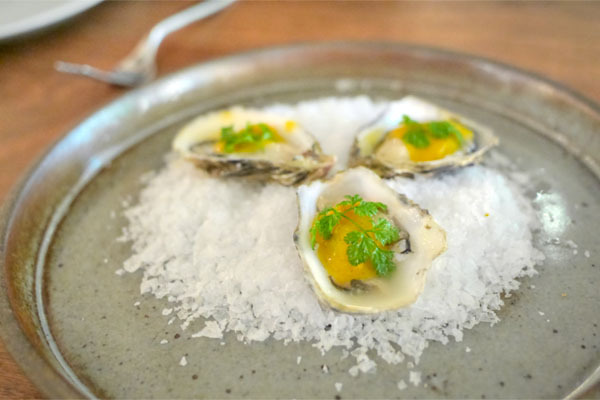 The Chef sent us oysters to start, and they were something else, sweet initially, but with an undercurrent of vadouvan spice that crept up and lingered long on the finish. I'd never had anything quite like it before in an oyster, and it's one of those where I'm not sure if I liked it or not. Our next course, meanwhile, was even more intriguing. The fish itself I found clean, and just a touch fatty, but the crux here was that combo of fruit and radish, which made for a great bittersweetness on the close that worked surprisingly well against the kanpachi. 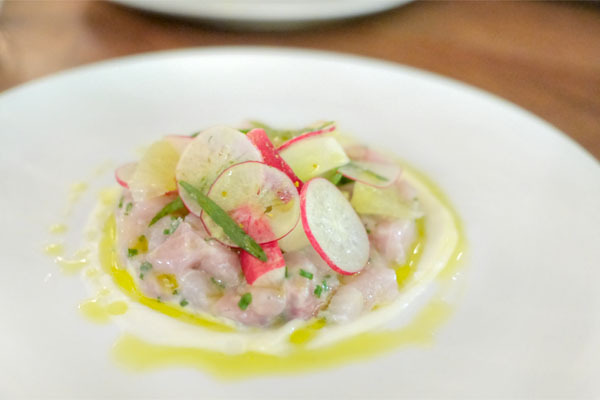 Loved the crunch of those radishes, too. Très cool. 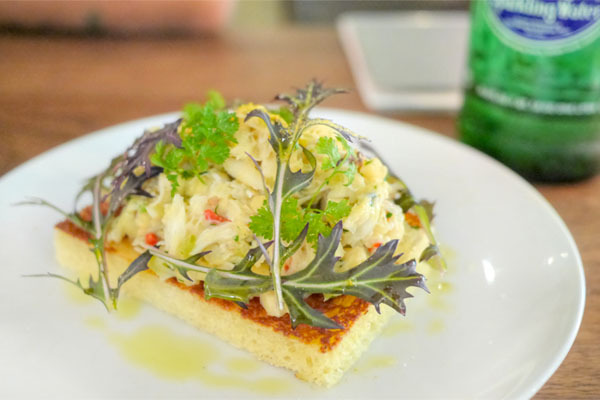 The crab toast came on the recommendation of our server, and definitely did not disappoint. Served hot and heaping here, the crab was the hero, conveying its sweet, saline flavors admirably with just a hint of overarching citrus-y zip. Very satisfying. Our server highly recommended the chicken liver as well, and he was spot on. In fact, it was one of the best I've had, reminding us of the version from the nearby Tavern, actually (when Gavin Mills used to work there). It was just utterly smooth, velvety, with a subtle, yet profound earthy twang to it that paired flawlessly with the sweet stratum of gelée on top. The burrata, too, was one of the more interesting plates I'd had. 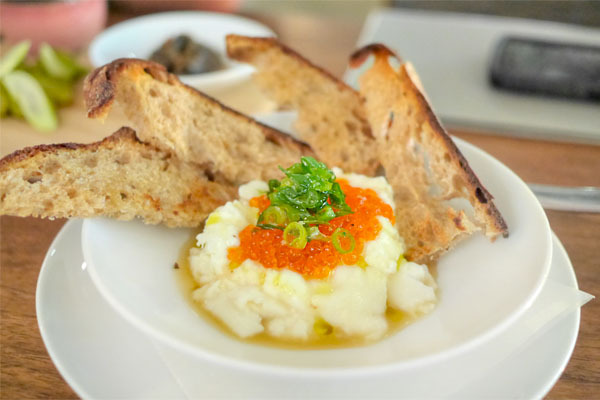 The key here was the great interplay between the lush, creamy cheese and the salty roe, all with an apparent, yet subdued undercurrent of sweetness from the maple. Really nice when taken with the bread. Our final small plate consisted of four arancini, which were just what you'd want from the rice balls: hearty, satisfying bites with just enough cheesiness, though I wasn't quite as keen on the spicy-sweet squash. 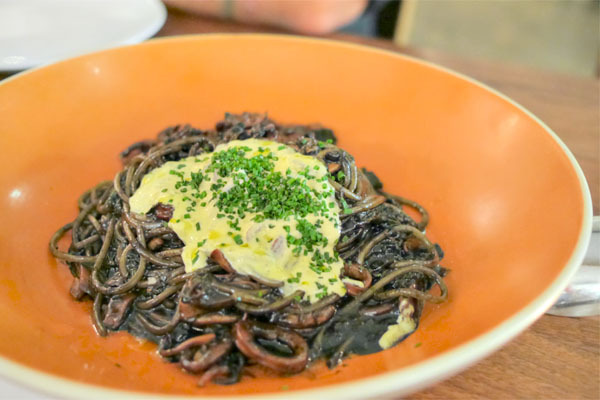 Squid ink spaghetti was a winner, properly textured and tasting of the ocean, with the squid itself adding a great textural counterpoint in the dish. The aioli served as an effective tempering element to the pasta, but I wouldn't have minded a bit more heat here. 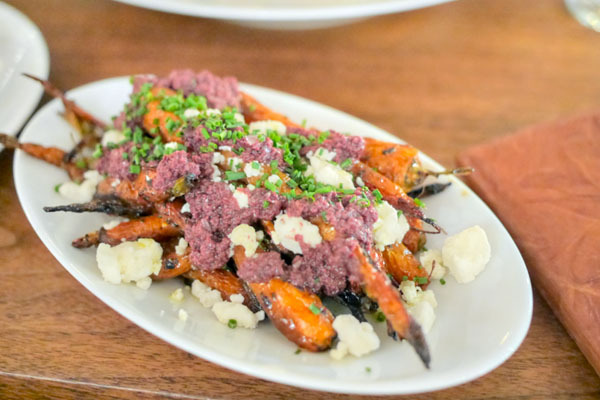 Carrots, though, went overly sweet for me, and the tapenade seemed only to amplify those flavors. The goat cheese, on the other hand, did help bring things down a notch. 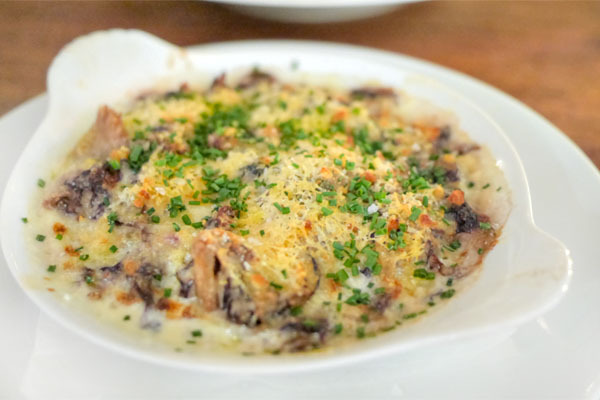 I'm a fan of almost anything au gratin, and this was no exception. I loved how the bitter crunch of the chicory was so proudly conveyed here, set against the comparative luxuriousness of the béchamel. The last savory was my favorite dish of the night, and one of the strongest presentations of octopus I've had in a while. It was also one of the most tender, really challenging the preparation at Bestia, and showed off a lovely char that definitely worked for me. I also appreciated the additional savoriness provided by the maitakes, while the beans and potatoes grounded the course. This is the one to get. Though we were quite full by this point, dessert was nevertheless a must. Click for a larger version. 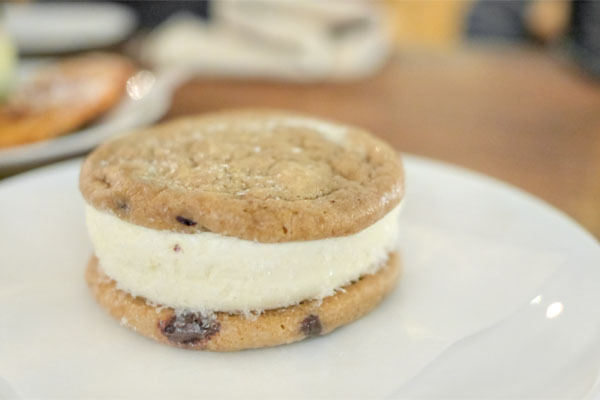 Since I'd never tried Coolhaus before, we went for one of their ice cream sammies, this one featuring Brown Butter Candied Bacon. I found it expectedly tasty, though I didn't get much bacon at all. The pot de crème, meanwhile, was much more special. 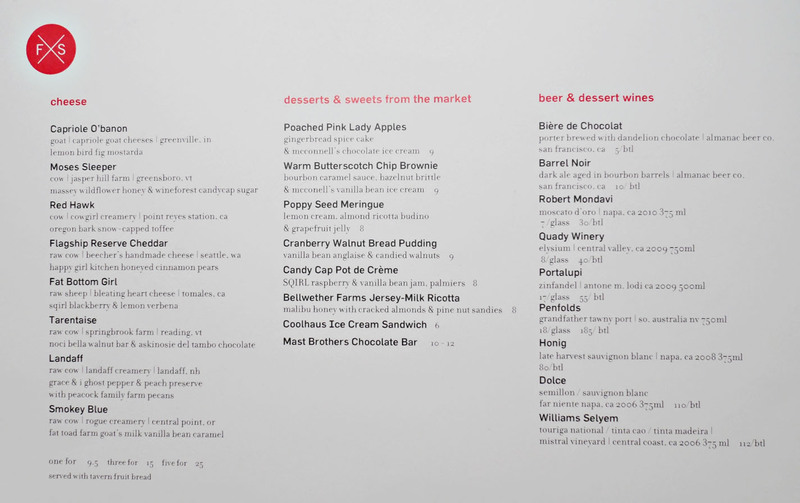 The custard itself was certainly commendable, but what surprised me was the candy cap mushroom, and how closely it imitated the sticky qualities of maple syrup. It was quite something, and I loved the flaky, buttery puff pastry cookies here too as an accompaniment. Given the clientele in the area, I wasn't expecting all that much coming in here, but Drew's cooking undoubtedly went above and beyond my presumptions of the place. 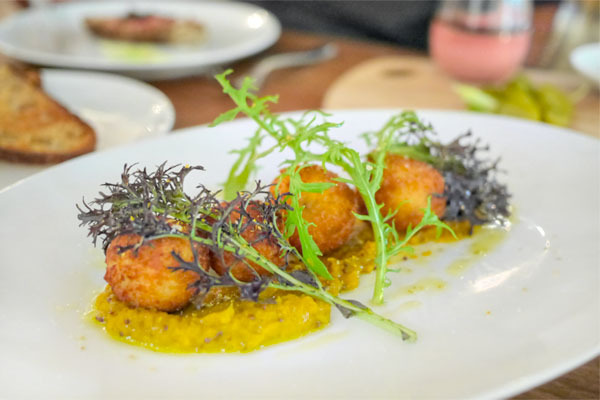 You get that Californian-Mediterranean flair with the food, sure, and the execution is on point, yes, but the kitchen is putting out some plates that truly go beyond the norm, with flavor profiles and combinations that veer way more ambitious than they need to be. In fact, I was so pleasantly surprised that I have to wonder if Farmshop is really the right stage for the Chef. We shall see, I suppose. What the hell does "given the clientele in the area" mean? Where do YOU live, Kevin? I'm just honestly baffled by what he means. Why on earth would one expect Brentwood (which, shockingly is where the Brentwood Country Mart is located, not Santa Monica), one of the wealthiest neighborhoods in Los Angeles, to not have a decent restaurant or two? The last time I was walking through Farmshop, I ended up seeing Scott Conant dining there. Thought it was definitely worth a try after that! What he probably means is that it's a bunch of uppity rich folks who have never been east of La Cienega in their lives. And Kevin isn't an uppity rich person? I think we all know he meant an older white crowd, but why could he not just say it? Jesus you guys are such haters! Really nothing else to do but keep trolling on something you dislike? Brentwood isn't really a hot spot for modern food with a lot of experience is it? I mean how many other places in the area have TK or similar lineage? It's just a little off the food path and everybody knows it. It has nothing to do with the actual age, race or income of the area. Wow. What a report. 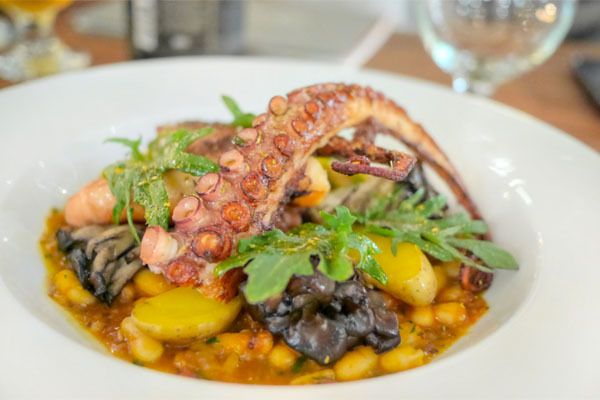 We've always loved the market (especially for their Frog Hollow Farms Flavor King Pluots -- best we've had anywhere), but we've never tried the restaurant. The oysters and octopus alone make it look worthwhile!